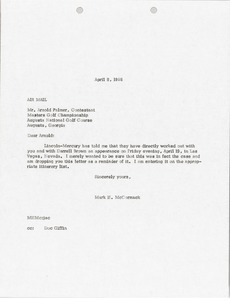 Writing to Arnold Palmer at the Masters Golf Championship verifying an appearance deal with Lincoln-Mercury in Las Vegas, Nevada. 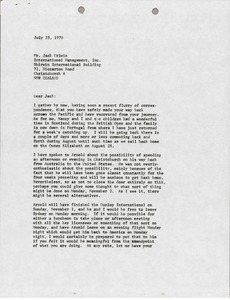 McCormack writes regarding Arnold Palmer potentially visiting Christchurch. 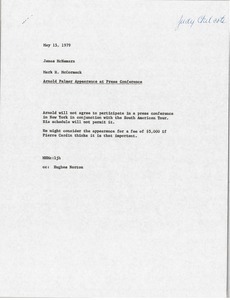 McCormack thanks Pugh for the finalized contract between Arnold Palmer and Samsonite and notes some of the details of the United States Open film program. Enclosing specifics for a pro-celebrity event at the Peter Jackson Classic and asking for Palmer's partner preferences. Enclosure not with letter. 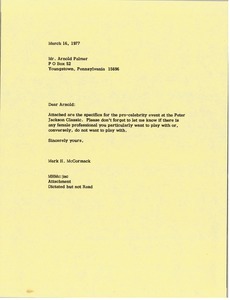 Cleveland (Ohio) - McCormack writes regarding Arnold Palmer's schedule and requesting more detail on what is expected of Palmer. 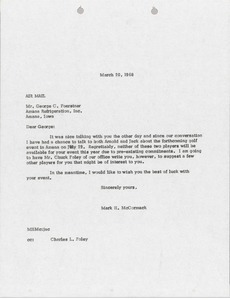 McCormack informs Foerstner that Arnold Palmer and Jack Nicklaus will be happy to attend the Amana event, but will have Chuck Foley from McCormack's office suggests other players that may be of interest to Foerstner. 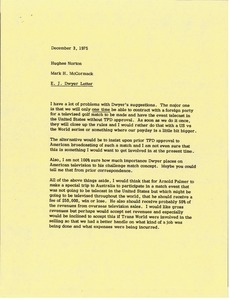 Concerning a letter from E. J. Dwyer, noting his problems with the proposal. 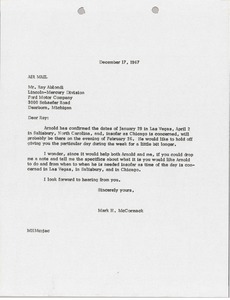 McCormack details his hesitation with the proposal discussing international film rights, American television rights, timing, and Arnold Palmer's fees for a trip to Australia. 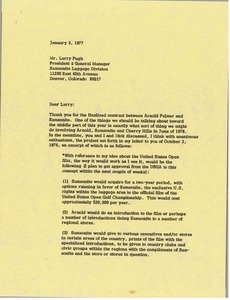 Informing McNamara that Arnold Palmer is not able to do a press conference regarding the South American Tour due to scheduling conflicts, but would consider it for a fee if considered important by Pierre Cardin. 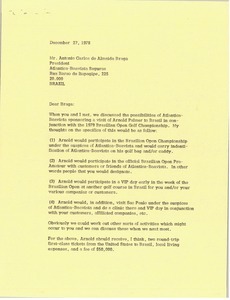 Brazil - Concerning the possibility of Atlantica-Boavista sponsoring a visit of Arnold Palmer to Brazil, in conjunction with the 1979 Brazilian Open Golf Championship. Includes specifics on Palmer's services and compensation. 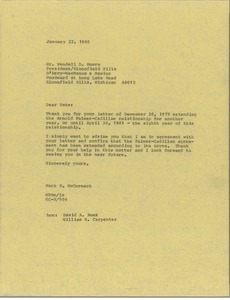 McCormack acknowledges the extension of the Arnold Palmer Cadillac contract.